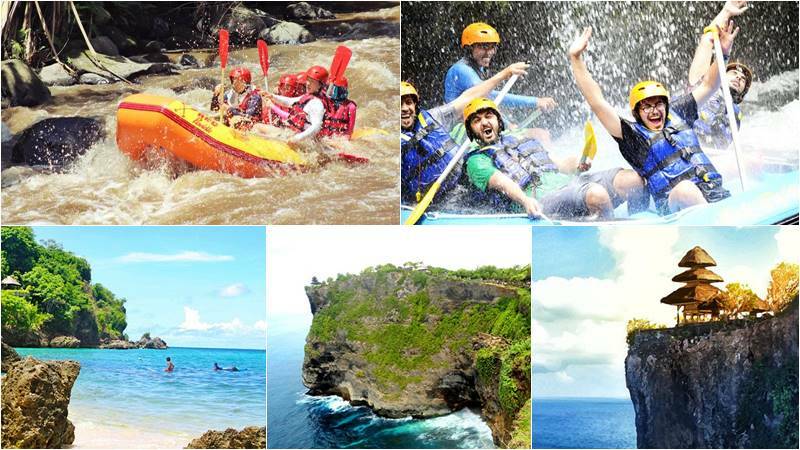 Bali Rafting + Uluwatu Cliff Temple tour is a famous Bali rafting tour package. The tour is a combination of Bali River Rafting with a visit to Uluwatu Cliff Temple with its amazing Indian Ccean view and wait for the beautiful sunset. You also can meet the monkeys around the temple. Get our special offers if you join our Bali Rafting tour only with Bali Rafting Adventure for the most memorable trip. 10.00 – Start Rafting Adventure with 2 hours journey. 12.00 – Finish Rafting, Going up to restaurant for shower and changes. 12.30 – Having Indonesian Buffet Lunch. 15.00 – Visit Padang – Padang Beach or Dreamland Beach or Pandawa Beach. 17.30 – Visit Uluwatu Cliff Temple. Enjoy 2 hours of white water rafting on the Ayung River along the Paradise River with gorgeous jungle, bamboo trees, cliff carving and waterfall. Or try the most challenging Telaga Waja white water rafting with its crystal water, beautiful scenery and jump 4 meters high from the water slide of Bajing Dam. Last option for your rafting is Melangit river, which has over thirty rapids with 1 to 4 meters in height. The turning river is sharp, current is fast and the impact of the river walls is challenging and makes the adventure with an 8 km journey more exciting. PADANG-PADANG BEACH: the famous white sandy beach in the Southern peninsula where Julia Robert takes a movie of Eat, Pray and Love, or visit DREAMLAND BEACH or PANDAWA BEACH a beautiful beach with a new popular tourist attraction. The Temple of Uluwatu is one of the Balinese Hindu Temple situated in the southern part of Bali, on the bank of the cliff, with a wonderful view of the Indian Ocean. It is incredible that this temple is constructed underneath the narrow peninsula with a deep rocky beach. It has a very beautiful view, especially of the time of sunset. There are monkeys around the temple who protect the temple from the bad influence based on the beliefs of the local people. Uluwatu Temple has the history and cultural heritage, which is one of the values and characteristics that many visitors visit. Most tourists come for the sunset view in the evening. For Single Traveler will be sharing with others as long we have a sharing pick up around your hotel. Free Pick up for area : Kuta, Legian, Seminyak, Canggu, Nusa Dua, Jimbaran, Sanur, Denpasar and Ubud. Pick up at other location can be arrange with extra charge during made a booking. Private car with fully air-conditioned. Ticket for the rafting with 3 options: Ayung River, Telaga Waja river or Melangit River..
All entrance ticket at scheduled stop. Payments in US Dollars (USD) or Indonesian Rupiah (IDR) or other currencies based on current exchange rate. 3% additional fee is required for payment by credit card. Private tours means there’s nobody else in the car, only you and your partner. Get special discount for group booking.